I just got to take a good look at the Curse Voice Client for Minecraft, here are my thoughts on it, why I will be using it and why you should consider using it as well. First of all, there is super easy Minecraft modpack installs, if you want an existing prebuilt modpack, it’s easy to just click install and be playing once it’s done downloading. Simply put, it’s an easier setup then other modpack launchers and very fast. Finding new modpacks now is super-fast! You can search by Name, Category, Author, Popularity, Total Downloads and more. After you find the right one for you, a single click will install it! You can easily search for your favourite modpacks also. The list of available modpacks is surely to grow over time and this will make it easy to find and install new modpacks to play. If you want to share a mod pack you made with a friend, then it’s fairly simple to share with the UI Wizard! What if you don’t want a prebuilt mod pack? Well then you can just install the mods you want and create your own, you have access to a large growing list of mods to choose from. Better than that, it will be easy to see which mods need updating and with 1 click update button, it’s hard to beat! Using this client it really makes it very easy to create your own modpack, it lists all the available mods and provides a great way to search for mods you may want and sort them by category. Why is the Curse Client better than others? Well a big reason why I wanted to try this, is better security. Some mod pack launchers could possibly gain access to your account information. The curse client will never access your username and password as it launches the Minecraft client itself after you launch the modpack, which then asks for your login details. Although the Curse Client has some great features, I noticed one feature was only for Curse Premium subscribers. The AddonSync is a feature that will sync computers so you don’t need to setup that mod pack more than once. It is very understandable that they don’t want to store data for everyone out there, so having this as a premium option is a good choice. Another quick one to note is Addon settings backup, which basically just saves all your settings and backs them up, if you have a system failure or crash. I have yet to test out the actual voice features of the Curse Client, but I do not feel that is necessary, as most people already use Skype and Teamspeak for voice communication. I doubt Curse will be successful in converting players to use their client to communicate instead. To me it seems as if this is Curse’s Version of a “Steam Client”, although I will only use it for Minecraft, when I clicked add a game, it gave a list of games it currently supports, which at the moment doesn’t seem like much, but I can see this list of games growing. 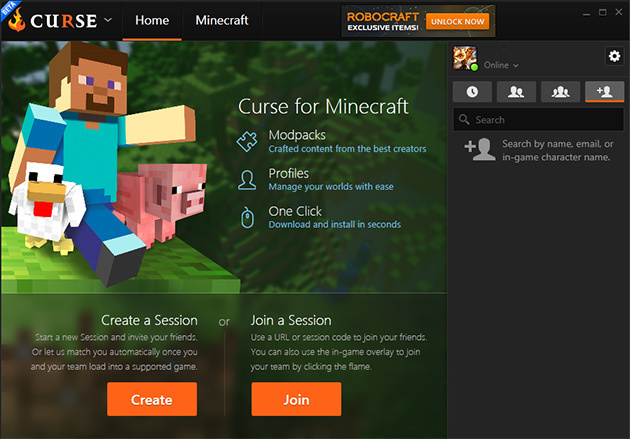 I highly recommend you download the Curse Voice Client for Minecraft and try it out. Download it here.